After my recent post on Hint, several readers emailed me with further suggestions for healthy, kid-friendly beverages. One reader recently sent me a link to Wateroos, plain and naturally flavored water in juice boxes. They sound very similar to Hint, but in a smaller package that would fit in with the Juice Box Crowd at preschool and the playground. Again, I hate to see the wasteful packaging; at least with Hint we are refilling the plastic bottles several times (and still get a tiny "hint" of flavor) before we recycle them. Juice boxes are not even recyclable in some areas. But still, it's a product I wanted to share for those of you in the midst of the Sweetened Beverage Battle. If it helps your child feel good about drinking water while those around them are sucking down Kool-Aid Jammers, I'm all for it. I think perhaps the best choice is a cute refillable water bottle, like these SIGG Kids Bottles and Klean Kanteens. We like our Klean Kanteens, but I've heard that the SIGG bottles chip and dent easily. Anyone want to share their experience with SIGGs? Also, I've been looking for for a long time is a juice box-shaped refillable water bottle. Anyone? Well, it happens to all of us, doesn't it? We all make mistakes, and somehow this one got past me and all the eyes helping me look over Vegan Lunch Box before it was printed. Last week, with the help of a sharp-eyed cook, we discovered a mistake in one of the recipes: on page 208, in the recipe for Red Rice, you should add 1 ¼ cups water, not ¼ cup. I apologize for any dry, crunchy rice that may have resulted from this inadvertent goof-up! To celebrate this error coming to light, I have created a brand new Corrections Page on the website (Don't you wish every cookbook had one? I do!) If any more mistakes come to light I'll be listing them there, so check back every once in a while. Many people have emailed me asking how they should handle social events now that they are vegan. What do you do when your business meeting lunch is going to be catered? When Aunt Fran invites you to dinner? When your Bible study group is meeting over donuts and pastries? Bring food. Always bring food. If they tell you you don't need to, bring food anyway. Unless you are absolutely positive about where you're going and what you will have there eat, bring food. Make a dish to share if it is appropriate; if not, bring a fun, well-balanced meal just for yourself. Because if you don't bring food (as I learned once again last week), you may end up with nothing to eat while all around you are enjoying a feast. This sends the wrong message about veganism to yourself and to everyone else. You may end up feeling hungry and sorry for yourself; your choice may start to feel lonely or isolating. Even worse, other people may look at you and decide that vegans are sad-looking people who eat nothing but carrot sticks. But bring along a vibrant, fabulous lunch or dish to share and you show yourself and them how fabulous vegan dining can be! Heeding my own advice, here's a little lunch I packed myself for a recent gathering. 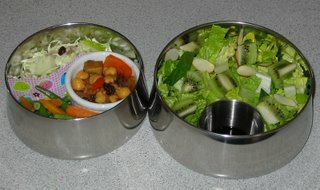 In the larger container is a green salad topped with kiwi fruit, almond slices, and strawberry balsamic vinegar (from Trader Joe's). The smaller container holds a trio of delightful dishes. First I prepared Green Beans & Carrots in a Tarragon Viniagrette from Vegan Lunch Box. By the way, if you're a health-conscious veghead like me, it's easy to cut back on the fat in this recipe; I used just a small drizzle of olive oil as opposed to 2 tablespoons. I also left out the salt and no one was the wiser; Shmoo helped finish the rest of these off with gusto. Across the happy pink divider is another salad: Cabbage, Apple, and Raisin Slaw from The Vegetarian Family Cookbook by Nava Atlas. I always hated slaw until I tried this one filled with tart apples and sweet raisins; I could eat the entire batch! But I resisted the urge and instead brought the rest to share. Next to the salads is a ramekin of Mediterranean Eggplant and Beans from Eat To Live. Creamy eggplant and chickpeas taste luscious together with onions and red bell pepper (gee, it's fun to feature foods shmoo would never touch!) I packed this dish in a microwave-safe container in case I wanted to warm it up. Verdict: It feels nice to be well-fed and taken care of, even when you're the one taking care of yourself! 5 stars. Our family hit the road last week for a special half-day trip to nearby Spokane (ooh, the big city!) At the last minute I decided our car trip snack was so colorful I just had to take a picture and post. 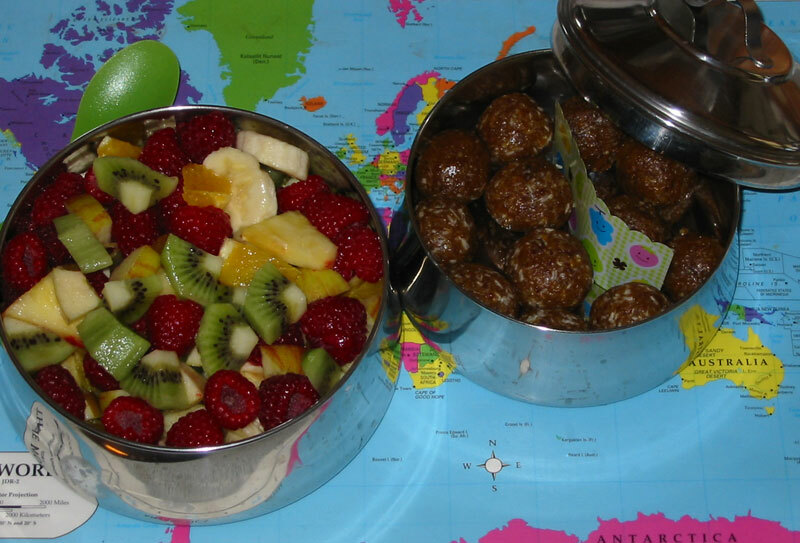 Our fruit salad for three is filled with banana, kiwi fruit, apple, orange, pineapple, and raspberries. The smaller container carries a travellin' supply of Apricot Date Fudge, one of our favorite recipes from Simple Foods for the Pack. This book contains a fabulous collection of "fudges" that remind me of Date Nut Pop'Ems -- kid-friendly treats made from mashed dried fruits and nuts. I like to keep some on hand for healthy shmoo snacks. These are made from dried apricots, dates, walnuts, coconut, and (here's the key) a squeeze of lime. The dividing paper is keeping my husband's coconut-free fudge separate (he's allergic). Verdict: We had a great trip! Sadly, I enjoyed our little car snack much more than I did our restaurant meal. I think I'm too spoiled by my own home cooking; vegan choices are really nonexistent sometimes. I ended up eating an iceberg lettuce salad and a plain baked potato. Next time I'm packing the whole meal, darn it! Last year I started experimenting with an idea I had for a "Full Meal Muffin" -- a main course muffin that contained all the good stuff (a fruit, a vegetable, whole grains, omega-3's, iron, calcium, and protein) and none of the bad (sugar, oil, salt). I experimented several times but never felt happy with the recipe; I found that even one scoop of protein powder made my muffins gooier and denser than I liked. I decided to toss the whole idea, but several of you emailed me after the book came out wondering what happened to the muffin. I was surprised so many of you remembered! So, back by popular demand, here it is: a new, improved Full Meal Muffin, sans protein powder but still filled with zucchini, banana, apple juice, omega-3-rich walnuts and iron- and calcium-rich blackstrap molasses. When Vegan Essentials sent out an email recently stating they had just received a shipment of Sheese all the way from Scotland, I knew I had to give it a try. This vegan cheese from across the Atlantic has been getting rave reviews, and I couldn't wait to try my son out on a healthier alternative to trans-fatty Tofutti. I packed a wedge of "smoked cheddar" Sheese with some unsalted rice crackers. 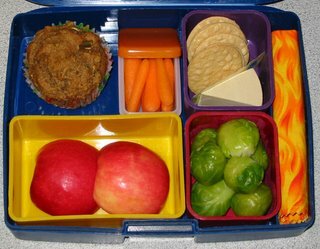 To finish off the meal we have Brussels sprouts, baby carrots (in a tiny orange-lidded container from BentoTV), and a small Pink Lady apple. Verdict: My goodness, you would think this kid had a Brussels sprouts deficiency, the way he jumped on those sprouts and gobbled them down! The muffin, crackers, apple, and carrots were next. But the Sheese? "Eeew," he said, taking one microscopic nibble and putting it down. What, is he crazy? Everyone I've given wedges of this Sheese to has been amazed at how good it tastes; it is far and away the best vegan cheese I have ever tried. Of course, I haven't tried Follow Your Heart yet, but this stuff blows Tofutti out of the water. Maybe it's the smoke flavor he didn't like? 4 stars. Of all the books I've had fun reviewing lately, this one most challenged and defied my expectations. 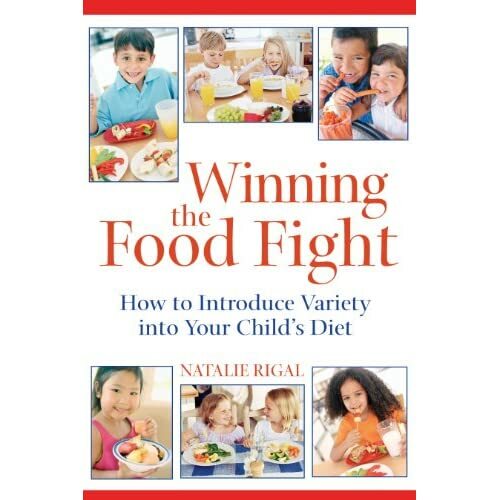 Looking at the cover of Winning the Food Fight by Natalie Rigal, I expected the usual: fun food presentation ideas ("turn an apple into an adorable choo-choo train! "), kid-friendly recipes ("Rockin' Rollin' Rainbow Wraps! "), and some kind of nutritional pyramid. Instead, what I found was a scientific look into what researchers call the "psychology of taste". How do children's taste preferences develop, and why? What is the effect of gender or age on food preference? 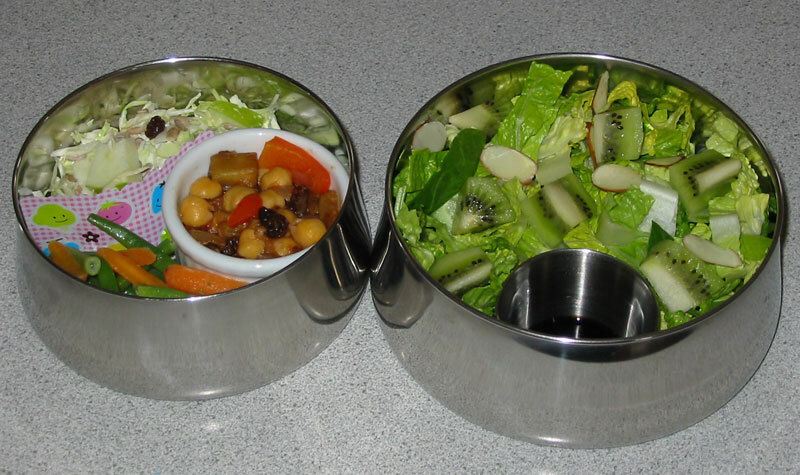 What causes children to gravitate towards certain foods and shy away from others, particularly vegetables? Rigal, a researcher and senior lecturer on developmental child psychology at the University of Paris at Nanterre, does a great job of collecting and exploring the vast array of scientific literature on the subject while interposing accounts of her own experiences with her children at the table. The study I found most charming highlighted for me the vast ocean of difference between the food culture of France and the one here in the U.S. In a study done in France on children aged 2 to 3 years during lunch at a day care, cauliflower "was chosen in 51% of the cases when prepared au gratin, in 49% when served with a béchamel sauce". Tomatoes were chosen in 52% of the cases when stuffed, but only 27% when served "à la Provençale". Wow. Where I live, 2 to 3 year olds in day care generally get a choice between the dinosaur-shaped chicken nuggets or the fluorescent orange mac-and-cheese. This is not the book to turn to on a busy weeknight when you're wondering what you can fix that the kids will eat; you'll find no recipes or fast-food hints here. But of all the books I've looked at recently, this one has provided me with the most fascinating food for thought. Peanut Butter & Jelly "Pop Hearts"
Happy Valentine's Day! Here's a treat to make for your own little sweethearts this Wednesday: Peanut Butter & Jelly "Pop Hearts". Start with a batch of Easy Pie Crust from Vegan Lunch Box, either the white or half-whole wheat version. Roll the pie crust out on a floured surface and cut into hearts using a 4-inch cookie cutter. Place one heart on a baking sheet lined with sprayed parchment paper. Dab a spoonful of nut butter into the center of the heart and top with a spoonful of your favorite fruit spread or jam. Spread out the butter and jam using the back of a spoon, leaving a half inch of space all around the edges. Brush the edges with cold water and top with another heart. Press the edges together and crimp all around with a fork. Bake at 400ºF for 20 minutes, or until lightly browned. 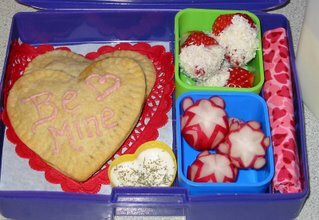 When the Pop Hearts are cool, decorate with any favorite icing or frosting (powdered sugar mixed with lemon juice or nondairy milk makes an easy, quick icing). These can be warmed up in a toaster oven or oven, but I fear the frosting would make a mess in a regular toaster. Makes about 10 4-inch Pop Hearts. 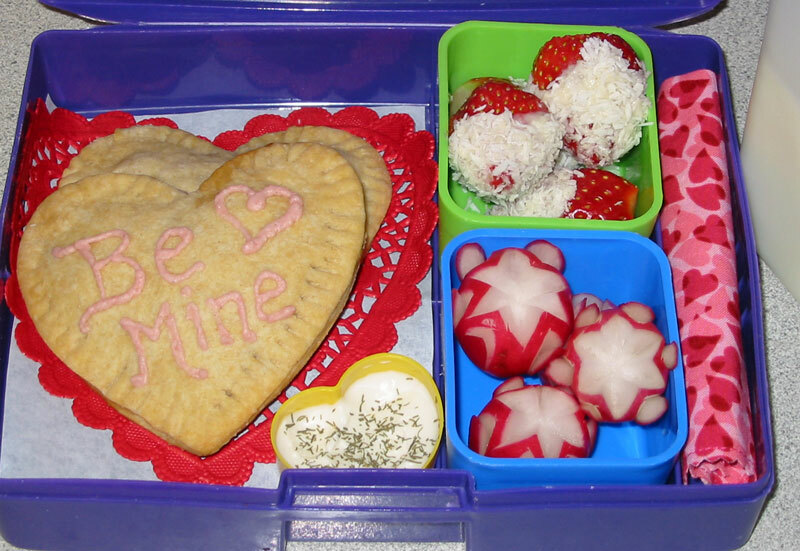 I also showed lunchy love today with radish rosettes, a yellow heart filled with Vegenaise and dill for dipping, strawberries dipped in melted vegan white chocolate and rolled in coconut, and a bottle of vanilla soymilk. Verdict: I love Valentine's Day; it's a great excuse to pull out the hearts and get all cutesy. Shmoo liked this version of the pb&j and ate up everything quick as a wink. I am now madly in love with the radish rosette and have been garnishing everything with them. The combination of strawberries, coconut, and vegan white chocolate is luscious. 5 stars. In my recent post in praise of Hint I talked about our struggles with the Juice/Soda/Sports Drink Monster, and about how having naturally flavored, unsweetened waters on hand has helped us tremendously. Many of you wrote in to share your own struggles with sweet drinks and to offer additional healthy beverage suggestions. I was especially taken with these Stevia Spring Water Flavors. I liked the idea of keeping a bottle in my purse to pull out at restaurants. I imagined dropping a few drops of fruit flavor into his water glass as a special treat, thereby cleverly avoiding the soda pop whine. "Ha HA!" I thought. "Take that, Soda Monster!" Well, we were sadly disappointed. First of all, the little bottles don't come with dropper tops, so you have to buy and pack a dropper or "disposable pipette" or make a big mess trying to pour out a few small drops. Without a dropper the liquid ran down the side and made a sticky mess. Shmoo reported that the flavors were okay in the water but left a strong, unpleasant taste in his mouth after drinking. So we're sticking with our beloved Hint, but I'm still looking forward to trying other healthy drink ideas, especially True Lemon (Update: Someone just pointed out that True Lemon and True Lime both contain lactose from milk -- this means they are not vegan, so we won't be trying them after all!) and Suzanne's Aromática de frutas. And yes, I have also tried serving fruit-flavored herbal teas quite a bit, although shmoo sees them as an excuse to hit the sugar bowl. In the meantime, does anyone want these little flavor bottles? ("This tastes terrible, try some.") We have grape, passion fruit, and mango; the last two are unopened. Email me with your address and they are yours. Update: they're gone! Some of you may have noticed that Vegan Lunch Box has been on backorder these last two weeks. That's right -- our first printing actually sold out in just 3 months, far exceeding all our expectations. Thanks again to everyone who bought a copy, recommended it to their friends, and wrote wonderful reviews on Amazon. I'm now happy to report that the second printing has arrived and all backorders will be packaged this weekend for shipment on Monday afternoon. Yes, the delivery truck pulled up and once again our dining room, living room, bedroom, and garage are filled with lovely brown boxes. They add that special touch to our home decor and make it impossible for me to fully open my closet door. Please help me reclaim my living space by buying a copy today! So many reasons to go vegan! Most people go vegan for their health, for the animals, for the environment, or for a combination of all of the above. But there are also a lot of people in our midst who came to veganism due to dairy allergies. My lovely sister-in-law, for example, went vegan after discovering that her newborn daughter was severely allergic to cow's milk. When she stopped consuming dairy products she realized that they had been upsetting her own tummy for years! Vegan cookbooks and websites helped her find new recipes to replace the dairy; from there, as she learned and read more, it was a natural progression to veganism. Hooray! So, if you or your children are allergic to dairy products, welcome! I hope you find a lot of fun dairy-free, kid-friendly ideas here to incorporate into your own mealtimes. And especially for you, I'm happy to say that Alisa Fleming from Go Dairy Free has just put out a helpful new guidebook called Diary Free Made Easy, filled with even more helpful information focused specifically on dairy-free living. The first part of this spiral-bound book gives readers an in-depth overview of dairy products, calcium concerns, allergies, and the many other reasons why people are choosing to kick dairy out the door. 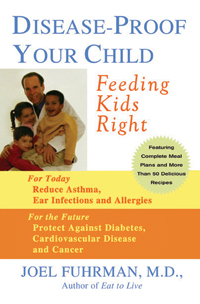 For those who are just starting out, the book includes a helpful list of "survival tips" for shopping, identifying hidden dairy ingredients, eating out, cooking, traveling, and feeding children. 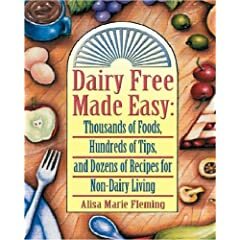 The chapter on non-dairy milk alternatives was my favorite; it featured a list of various non-dairy milks along with instructions on how to make your own soy, rice, almond, oat, and coconut milk at home. The recipe section includes more alternatives to traditionally dairy-filled favorites like mashed potatoes, whipped cream, cheesecake, and more. The coupons and product listings are obviously time-sensitive, but Alisa plans to maintain downloadable PDFs of the product lists on her website. With all these great new products and recipes, living a dairy-free life is getting easier all the time! Jif Peanut Butter is hosting a Most Creative Peanut Butter Sandwich Contest. One of the contestants, Terry, invited the shmoo and I to try out her daughter Julie's creation, the Texas Roll 'Em Up: a tortilla (I used whole wheat) spread with peanut butter and filled with a black bean-corn-salsa mixture. It's a surprising combination, but Terry says "it makes a good lunch box sandwich, it packs well. Julie takes it to school everyday now. It is her favorite sandwich...We usually eat it without the guacamole and sour cream." I appreciated the fact that, unlike most of the contestants, this sandwich included a nice serving of vegetables (corn, tomato salsa) along with a hearty amount of vegan protein (nut butter and beans). 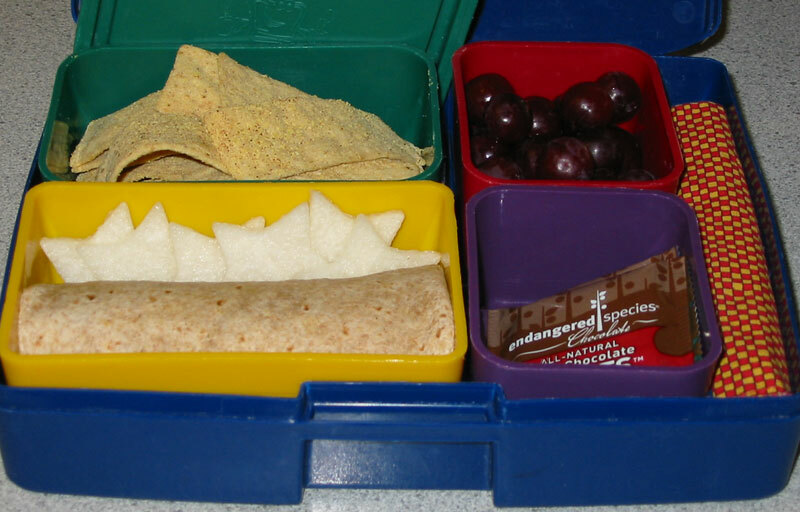 I packed the Roll 'Em Up with jicama stars, Durritas (store-bought tortilla chips with a "cheezy" topping from Ultimate Uncheese), organic purple grapes, and Dark Chocolate Love Treats. Verdict: Shmoo thought the taste of peanut butter mixed with beans and salsa was a bit odd, but it only took a couple bites to adapt. We all appreciated how the creamy, unctuous quality of the nut butter stood in for the cheese you would typically find in a Southwestern wrap. Leftover bean-corn-salsa mix makes a great salad served on a bed of greens with diced avocado. 4 stars. P.S. The Texas Roll 'Em Up is one of ten finalists that you can vote for online, so head over to Jif to check out all the entries and pick a favorite. Many of the entries are fun, creative and vegan-friendly. Voting ends tomorrow, so vote fast! P.P.S. Never, never, ever would I suggest actually using Jif Peanut Butter. Stick with all-natural nut butters made without added shortening, sugar, and salt.